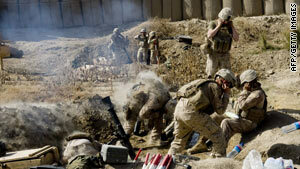 U.S. Marines fire mortar rounds from their forward operating base in Helmand Province, Afghanistan. Washington (CNN) -- When President Obama took to the world stage to detail U.S. policy toward Afghanistan, he hammered home a key foreign policy principle: Success in Afghanistan is "inextricably linked to our partnership with Pakistan." "We are in Afghanistan to prevent a cancer from once again spreading through that country," he said in his Tuesday night speech at West Point. "But this same cancer has also taken root in the border region of Pakistan. That is why we need a strategy that works on both sides of the border." One U.S. counterterrorism official told CNN the Afghan Taliban has bolstered its ranks, stepped up its attacks and increased its territory. In Pakistan, al Qaeda and other militants persist in planning strikes against U.S. interests in the region, the official said. "They've suffered some major losses, but no one should think for a second that they're down and out for good," the official said. "They remain intent on harming the United States and our allies, including Pakistan, so keeping up the pressure on them is critical. That's exactly what we're doing." Islamabad-based political analyst Pervez Hoodbhoy said if the Taliban should prevail in Afghanistan, it will be a disaster. "That is because the local Taliban, the Pakistani Taliban, are the ideological brothers of the Afghan Taliban, and they will gain enormous strength if the Taliban in Afghanistan sweep across the country." Because of this scenario, Obama has from the start of his presidency linked the fight in Afghanistan with the effort to combat militants in Pakistan. When Obama announced his policy toward Afghanistan and Pakistan in March, he outlined an extensive plan for Pakistan that included bolstering Afghanistan-Pakistan cooperation, helping the security forces fight militants, increasing economic assistance and improving Pakistan's governmental capacity and performance. He reiterated those points in his Tuesday speech and said Pakistanis understand the gravity of the fight. "In the past, there have been those in Pakistan who have argued that the struggle against extremism is not their fight, and that Pakistan is better off doing little or seeking accommodation with those who use violence. But in recent years, as innocents have been killed from Karachi to Islamabad, it has become clear that it is the Pakistani people who are the most endangered by extremism. Public opinion has turned," Obama said. While there's no agreement between the United States and Pakistan to deploy U.S. troops into that country, there have been drone strikes against militant targets in Pakistan's northwestern tribal areas near the Afghan border. CIA director Leon Panetta said in May that airstrikes aimed at al Qaeda leaders in Pakistan have been "very effective." The U.S. military in neighboring Afghanistan does not comment on the attacks, which typically target Islamic militants in the border region. But the United States is the only country operating in the region known to have the capability to launch missiles from remote-controlled aircraft. The New York Times on Wednesday said Obama now "has authorized an expansion of the war in Pakistan," a report denied by the Pakistani government. The newspaper reported "the CIA delivered a plan for widening the campaign of strikes against militants by drone aircraft in Pakistan, sending additional spies there and securing a White House commitment to bulk up the CIA's budget for operations inside the country." The dispatch said the "expanded operations could include drone strikes in the southern province of Baluchistan, where senior Afghan Taliban leaders are believed to be hiding, officials said. It is from there that they direct many of the attacks on American troops, attacks that are likely to increase as more Americans pour into Afghanistan." Without getting into specifics and not commenting directly on the New York Times story, a U.S. official told CNN that it "stands to reason" that an expanded military presence in Afghanistan "will lead to an intensification of intelligence efforts in the region to support U.S. strategic goals." The Pakistani government on Wednesday said that the president "correctly mentioned that the struggle against violent extremism extends well beyond the region" and that Pakistan is committed to "uprooting terrorism" and working with the United States. Also, the government is confident that a troop surge in Afghanistan won't prompt a militant spillover into Pakistan. This year Pakistan has responded to the Taliban presence, launching military offensives this year against militants in the Swat Valley and South Waziristan. David S. Sedney, U.S. deputy assistant secretary of defense for Central Asia, said the Pakistani military will be facing challenges in South Waziristan, such as "counter attacks and additional pressure," but said the military and government have been engaged in an "impressive" campaign against the militants. "It is going to be hard for them. but they are a sovereign country with a proud military, and we really expect they will be able to control their entire territory with a continuation of that effort they have already shown," Sedney said.